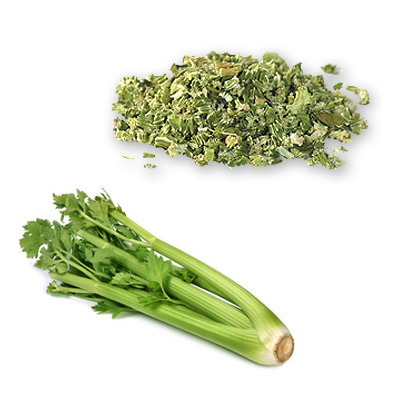 The product is made from the stalk and leaf portions of freshly harvested head celery which has been washed, trimmed, diced (3/16" x 3/4"), and dried. These dehydrated celery flakes are twice as strong as the fresh vegetable, so use only about half as much in your recipe. Add celery flakes to chicken or vegetable soup, stews, stocks, poultry stuffing or anywhere else fresh celery flakes are called for.